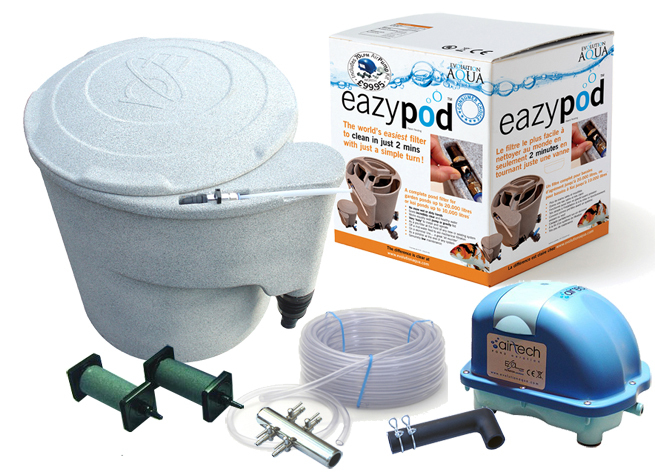 The Eazy Pod, best small pond filter just got better ! Due to popular demand the Eazy Pod is now also available with an Airtech 70 Air Pump kit. Introducing the Eazy Pod Air, yes thats right the kit includes a Airtech 70 Air Pump, manifold, 10m airline & 2 air stones. The Eazy pod Air for smaller ponds has unparalleled results, the Eazy Pod Air is the latest to come from the Evolution Aqua stable and is set to meet the challenge of today's koi Pond enthusiast. The Eazy Pod Air also comes with a compact lid as standard. The Eazy pod Air is ideal on a quarantine system or as a pre-filter, polisher or on a skimmer line, a great all rounder! The Eazy Pod Air is also perfect for extra biological filtration. Why not order your Eazy Pod Air, for the user who wants the ultimate performance. The Eazy Pod consists of a first stage settlement chamber where in which the heavier solids can settle out, before moving through static Kaldnes media retained in a stainless steel perforated screen where the fine particles are trapped. The central chamber holds 30 litres of static K1 media. As the water enters the central chamber, the fine smaller solids become entrapped in the K1. After passing through the K1 media, the clean water then rises and overflows into the inner return pipe of the Eazy Pod and back to the pond. The Eazy Pod has been modified from 2012, now the inlet on the new Eazy Pod features a welded 1.5 inch Slide Valve with 1.5 inch hose tail, making pump fed installation even easier, for gravity fed installations simply remove this and use the 4 inch x 3 inch flexible rubber boot supplied to contact to the bottom drain.The waste on the Eazy Pod has also been made simpler with the introduction of a 1.5 inch Slide Valve. The Eazy Pod also comes with a compact lid as standard. This is a totally different way of filtering to the NeXus Eazy as with the famous Nexus Eazy the K1 media is continually moving, with the Eazy Pod the K1 media is static. The Airtech 70 Air Pump, from day to day running will be putting vital oxygen in to the pond, when you need to clean the Eazy Pod Air simply turn the valve and redirect the Air to the Eazy Pod, this will agitate the static K1 and therefore cleaning can be done quickly and easily without getting your hands wet, when you have done simply turn the air valve on the Eazy pod and send the Air back to the pond, it really is that Easy! There is little doubt that this New Eazy Pod has turned the small filter market up side down, with the addition of the Air Pump kit, the Eazy Pod Air just got better!